Following on the heels of Chris Colfer’s win at the Golden Globes last Sunday, Entertainment Weekly has splashed Glee’s new leading man on next week’s cover – alongside his on-screen love, Darren Criss. 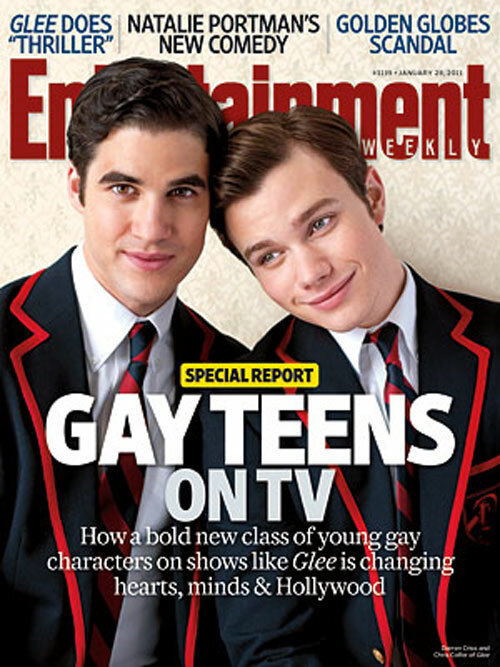 The special issue will devote a feature to gay teens on television. And there are a lot! Gay rights and gays portrayed positively in popular culture are all braided up these days in a fantastic way. Our voices, our lives, our stories have a momentum behind them like never before. Seeing this gay, teen love story on the cover of an institution of a magazine like Entertainment Weekly really makes it hard to ignore how much progress we’ve made over the last few years. Gay is good, y’all! Are you happy to see EW’s cover boys?